The Octomore 1695 Discovery is a special bottling on the occasion of the Feis Ile 2014. On February 18, 2007, Jim McEwan produced a fourfold distilled spirit based on extremely heavily grounded malt. This distillate then matured in Oloroso Sherry Butts. After seven years, the whisky was finally diluted with some spring water from the Octomore farm to 69.5% by volume and bottled in 1,695 bottles. These bottles were on 25 May 2014 exclusively for the visitors of the distillery for sale and were sold out within a short time. Overall: Can you stand it? Go without water. The alcohol is the biggest problem, he wins water addition clearly, but still the sharpness remains something. An unusual whisky that has taken the Oloroso barrel well. Another two years more would do him good. Too bad that one does not experience the ppm number. the alcohol softens even more and releases more aromas. The burning gum is almost gone and gives way to a dry smoke, Octomore-typical I would say. Bottle # 1259 sold empty at ebay. Ce feu de bois éteint transporte une fraîcheur citronnée. Bien qu'il démontre une certaine puissance, il ne manque pas de rondeur. Confiserie tirant sur la cerise. Avec l'ouverture il se fait crémeux, pâtissier. L'influence du sherry est perceptible, elle est chocolatée. Je ne connais pas les ppm, mais finalement je le trouve plutôt sage de ce point de vue. La tourbe me semble sèche et fibreuse. La bouche est puissante mais ne livre pas le choc prévisible des 69,5%. Un mélange de chocolat, de viande fumée, de sel. Avec l'ouverture la puissance semble se renforcer, mais les saveurs restent identiques, ajoutant un peu d'orange. La tourbe est plus poisseuse, plus portée sur de le suie. Salée, viande fumée. Bien entendu la fumée de tourbe va soutenir cette finale à bout de bras, avec cette suie épaisse. [October, 2014] I had this dram during a "Feis Ile 2014" tasting at Bonn. In my old rating system (ten scales that translate into WB points: 50 - 66 - 75 - 80 - 82,5 - 85 - 87,5 - 90 - 92,5 - 95) I scored it 80 points only. My notes state a flat, aggressive and alcoholic profile that gets even more punchy and alcoholic with water added. Guess why? Nose: Starting out quite lemony. I’m getting lots of lemon Popsicles, Like my kids love eating in summer. Then quite a bit of creamy vanilla , leather and lots of alcohol. No wonder eh? Not a lot of peat. Adding a splash of water does bring out more of it. Wood smoke and some earthy dirty peat, and a hint of bacon. Palate: Whoa!! Damn. This is some abv. What a mouthful. Explosive! (Sorry). Hot chilly. Lots of cured bacon. Soot. Wood smoke. Pepper and Demerara sugar. Very sooty. Dirty leather. Even hints of farm yard. Finish : Lemon pie. Leather. Vanilla. Bacon. very nice and creamy. For a dram that is close to being 70% ABV, this is surprisingly drinkable and approachable, without the need for a lot of water to tame it down. I do think a splash of the old ‘aqua’ will help it, and bring out the nice wood smoke and more of that bacon. One of the creamiest Octomores to date (if you can call it Creamy), and certainly a nice sip. 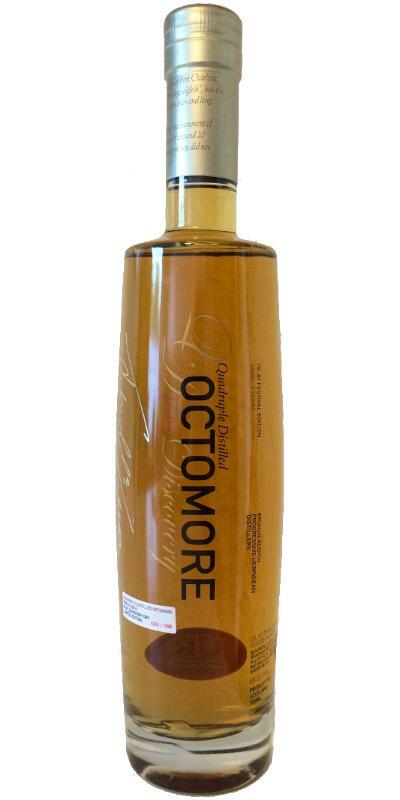 Having said all that, It’s not my favourite all time Octomore. Still does not reach the heights of the Orpheus. A solid dram, in a beautiful bottle, very appealing to the peat freak no doubt.